Plant polyphenols are secondary metabolites that constitute one of the most common and widespread groups of natural products. They are crucial constituents of a large and diverse range of biological functions and processes, and provide many benefits to both plants and humans. 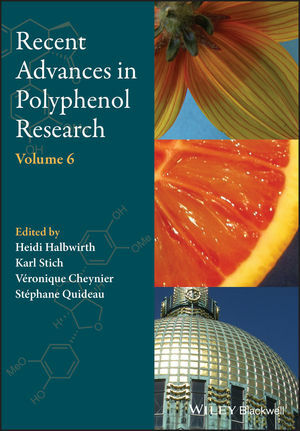 Many polyphenols, from their structurally simplest representatives to their oligo/polymeric versions, are notably known as phytoestrogens, plant pigments, potent antioxidants, and protein interacting agents. This book is a distillation of the most current information, and as such, will surely prove an invaluable source for chemists, biochemists, plant scientists, pharmacognosists and pharmacologists, biologists, ecologists, food scientists and nutritionists. Heidi Halbwirth is Associate Professor at Technische Universität Wien in Vienna, Austria. Her research activities have concentrated on plant secondary metabolism in horticulturally relevant plants with a strong focus on the enzymes involved and their structure-function relationships. Her particular research passion is flower colour, which allows the study of fundamental aspects of plant biochemistry and physiology. Karl Stich is Professor at Technische Universität Wien in Vienna, Austria. His field of expertise is the biochemistry of plants, and applied biochemistry in the field of plant protection with a strong focus on the secondary metabolism of plants. He is a longstanding member of Groupe Polyphenols and was awarded the 11th GP Medal for his scientific contributions to the elucidation of the flavonoid pathway. Véronique Cheynier, former president of the " Groupe Polyphénols " (2012-2016), is research director at the French National Institute for Agricultural Research (INRA) in Montpellier, France. Her research interests concern the study of the structure of polyphenolic compounds, notably vegetable tannins and anthocyanin pigments, their reactions during plant transformation processes, and their influence on the quality of foods and beverages, especially wine. Stéphane Quideau, former president of the " Groupe Polyphénols " (2008-2012), is full professor of Organic and Bioorganic Chemistry at the University of Bordeaux, France. His research laboratory is specialized in plant polyphenol chemistry and chemical biology, with a focus on the studies of ellagitannin chemical reactivity and synthesis, and interactions of bioactive polyphenols with their protein targets.